Simone is the chef-owner and the buck-stopper for LTNS. She was born in Chengdu, the capital of China's southwestern Sichuan Province. 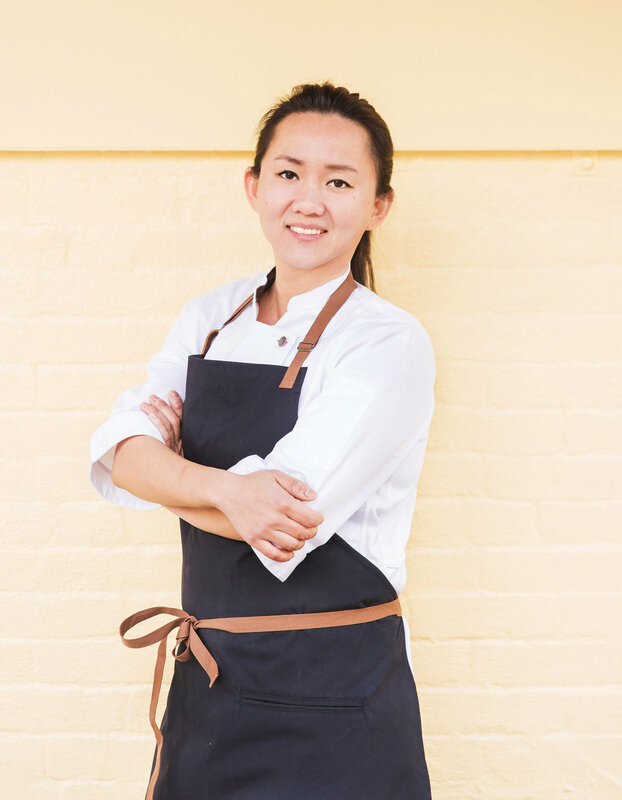 Before embarking on her culinary career, she studied in Chengdu, Beijing, Macau, Hong Kong, Singapore and Australia. She graduated from UNC-Chapel Hill in 2006 with degrees in economics and psychology. Chef Simone eventually enrolled in the Institute of Culinary Education in New York City, graduating with highest honors. She went to work at wd-50, Alder and 15 East. In the Summer of 2016, she embarked on a three-month culinary and research adventure through Yunnan province. Starting from the capital city of Kunming, she visited the ancient towns of Dali and Lijiang, hiked through the Jade Dragon Snow Mountain and trekked through the breathtaking Tiger Leaping Gorge, into the majestic Ganden Sumtseling Monastery in Shangri-La bordering Tibet and Sichuan. At each turn and in each ancient city, there is a magical recipe to be learned and adapted, and through her cooking, Chef Simone shares the story of the experience and the flavors and dishes experienced during that special time. Emmeline is the general manager and panda caretaker for LTNS. She grew up in North Carolina, developing her palate there in the south as well as in China and Japan. Her love of food and beverage took form during childhood, when dinner at home was a practice in playing restaurant -- blackboard menu and all -- and when packed lunches for school was a four-component bento box rooted in dishes like red-cooked squid and tea egg (or, to her American peers, "chocolate egg"). She is not a food or beverage snob, she swears. Emmeline worked at Wylie Dufresne's Alder and was a fromagère at Casellula while also leading the restaurant's social media and marketing efforts. In her other life, Emmeline also works as a journalist covering education. She is editor of TopSheet and senior editor for special projects at The 74, a nonprofit education news website. She previously worked for The Huffington Post and The Wall Street Journal. She earned a B.A. in public policy and certificate in policy journalism and media studies from Duke University, and studied science, ethics and policy while at the University of Oxford. Tracy Qiu is the social media and marketing guru and a partner for LTNS. She grew up eating rice noodle and it became a lifelong passion for her to find the best rice noodle dishes anywhere she goes. She was born in Guangxi and frequently traveled to Yunnan to visit her relatives when she was young. The local noodle dishes from the two provinces have influenced her taste for bold flavors and fresh ingredients. Rice noodles were literally her breakfast every day until she left China at the age of 15. It was a depressing day when she realized there was no such thing as a "rice noodle shop" in America, like there was everywhere in her hometown. You can only imagine how excited she is to help bring one to New York. With bachelor's degree in film and economics from U.C Berkeley, Tracy started her career in television as a producer in the San Francisco Bay Area. After moving to New York, she worked at Cartier before starting her own e-commerce businesses specializing in curated fashion brands. She has further sharpened her skill in branding and marketing as she runs her business day in and day out.